The Daily Mail has failed in a legal challenge to prevent JK Rowling from reading a unilateral statement in open court as part of a libel settlement. The Mail paid damages and apologised to the author last year over an article about her time as a single mother. But the paper objected to some parts of the statement she planned to make. However, the Court of Appeal in London has now dismissed the paper's challenge to a High Court ruling that she should be allowed to read the statement. No date has yet been set for the statement to be delivered. A spokesperson for Rowling said the author was "pleased at the judgment". 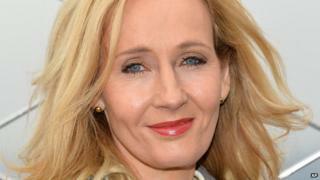 The dispute follows a 2013 article that suggested she had told a false "sob story" about being stigmatised by churchgoers in Edinburgh during the 1990s, before she found success with the Harry Potter novels. The writer said the newspaper's story was "premised on a false picture" of an article she had written 10 days earlier for single parents' charity Gingerbread. She said she had not accused fellow churchgoers of "stigmatising" or "cruelly taunting her", but had referred to "a single occasion involving a woman who had visited the church one day while she was working there". Rowling said the Daily Mail had been "misleading" and "unfair" and had injured her reputation and caused her great distress and embarrassment. The Daily Mail accepted the author had not made any false claims, apologised and paid "substantial damages". The newspaper's apology said: "Our September 28, 2013 article 'How JK's sob story about her single mother past surprised and confused the church members who cared for her' suggested that JK Rowling made a knowingly false and inexcusable claim in an article for the Gingerbread charity that people at her church had stigmatised her and cruelly taunted her for being a single mother. "In fact Mrs Rowling recounted only one incident where a visitor to the church stigmatised and taunted her on a particular day. "We accept that Ms Rowling's article did not contain any false claims and apologise for any contrary suggestion and have agreed to pay substantial damages to Ms Rowling, which she is donating to charity, and a contribution to her legal costs." A spokesperson for the Daily Mail said the paper had appealed Rowling's statement because it was seeking "consistency" between her original complaint and the words she planned to use. The paper said: "We have already apologised and paid damages to Ms Rowling over the article concerned and regret any further upset caused to her by the delay in the legal process. "This appeal was not a challenge to her right to a statement in open court. It concerned a point of principle that Lord Justice Laws noted was arguable and important when he granted us permission to appeal. "We were seeking consistency between a complainant's pleaded complaint, as accepted by the defendant, and the description of it in a claimant's unilateral statement in open court. "We are disappointed that the court of appeal has not taken this opportunity to ensure that consistency."